What is the golden ticket to making ads successful no matter what? 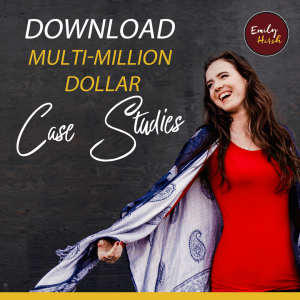 In this episode, you will get the inside scoop: we dive into case studies and talk about real results to answer this question. 6:23 Do we ever have clients that Facebook ads don’t work for? 10:40 An answer to one of the most commonly asked questions: when do you turn your ad off? In today’s episode I’m going to give you the inside scoop, which is the golden ticket to making ads successful no matter what. I get asked this question a lot whenever I’m on a potential client sales call, I don’t actually do a lot of my sales calls but sometimes when I meet someone at an event if they’re a referral I will do a sales call and somebody asks me, “I mean how do you know this is going to work? Will this work for me. Will Facebook ads work for me. Will working with your company work for me? How do you know, and like are you competent in it?” And what I tell people always is marketing always will work for everybody. Your audience is on Facebook, 99% of your audience is on Facebook or Instagram and/or Instagram, and it will work, it’s a matter of when and how many changes and different things do you need to try. Now for the most part we work with people who already have proven products and funnels in some way, whether they sold a few organically, or they have a small following, they know that they’re answering a problem that exists, and I will normally do that kind of filtering before we bring somebody on our roster because that’s who we best serve. So, this example I’m going to share with you is coming from somebody who we knew, they had a webinar and product that worked. But the reason I say that is because you don’t just try three things with marketing and then, well it didn’t work and that’s it, so you quit. So this is truly the golden ticket to making ads successful no matter what. And, a lot of times people come to our agency after working with somebody else or an agency or an ad’s manager and they’re like, “Can you help me? Can you look in my account first to make sure you can help me?” And what I see when I go in there is that they had a campaign that didn’t work, and it had like maybe 15 ad sets. Which means they tried maybe 15 audiences or maybe even less if they were separating out different creative with one audience. And so here is our philosophy, on the Hirsh team, and here is why all of our clients see success. Some in 30 days, some in 10 days, some in 90 days. It depends on how much you have to tweak, and it’s not always about the Facebook ad, sometimes it’s about the funnel. But you will have success if you are in it for the long game. And so I’m going to tell you guys a story. Because I think that sometimes we give up too soon. So we had a client who was with us for about three months, and we took over, well they were with us for about three months and then … so we took over their ads initially, from an agency who did a terrible job, overspent their money, they weren’t seeing results, they brought their ads in house. They couldn’t do it because they had a big budget, $30,000 a month, brought us, and initially it was going really well, and they were getting great leads. We had a ton of audiences and warm traffic and things that we could leverage that hadn’t been leveraged and then in about 90 days the cost per lead started to spike way up. Like one day we had one ad set that was spiking $600 a day for the last like six months, and it went overnight from like $ 10 a lead, or $8 a lead was our threshold for their webinar to like $30 a lead. And they were spending $600 a day, which was a huge percentage. I can’t remember exactly how much, but it was a huge percentage of their daily spend and so we were like crap, we had to turn that off, and we had to figure out how to get it to work. And so what we did, at that point, was our creative team got together with the ad’s manager on the account, and we created all these different messaging variations that we could use. At first, it was like four or five. It was different messaging from different copy and images, headlines, four to five different versions. And then we went through the data, and we leveraged the crap out of the pixels. We did look alike of past webinar registrants. Look alike of people who attended the webinar, look alike of people who have landed on the landing page. Look alike of people who went to the sales page, order form page, all these intra-space targeting. Like a ton of audiences and over the course of like 10 days we created 400 ads. Now for us an ad means like there could be one audience that has three versions because we have three different creatives. We separate out our creatives on our team. But 400 ad sets. And we got it to work, and it was converting, and it was back to how it was. It was actually better we got the cost per lead down to like four or five dollars, and they’re revenue started to take off and what happens there is like … what I tell people is, there’s no other agency who can do a better job because we do everything until it’s working and that’s exactly how you have to look at marketing. It’s like, it’s not like you tried three audiences, you spend $25, or you tried a couple of creative versions and then it didn’t work and so that’s it, Facebook ads don’t work for you and I see this way, way, way too much because people what the overnight success, or they’re afraid when they end spending $25, and it doesn’t work. I said this in a previous episode, but when you spend money, and it doesn’t work, use that data to never waste it on that type of a thing, that messaging or that audience again, and it’s not wasted money when you do that. So marketing will always work, and it’s just a matter of how long and how much changing and shifting do you need to do. That is the key and when people ask me, “Do you ever have clients who it doesn’t work out, or it doesn’t work for you or work for them, like your marketing or your agency?” And I say, no, honestly we don’t because, we have clients who out the gate, the initial creative versions that we put out don’t work, yes there’s something off with the messaging, and you don’t know that, we do our best obviously to figure that out, but you don’t know always how your audience is going to respond to or what they’re going to respond to, or what ad copy is going to get them to click or what landing page headline you need to have. Like all those things, you don’t necessarily know until you start spending money, until you start putting things out there. So I would say 25% of the time we start a campaign and initially out the gate in the first week it doesn’t work how we want it to work. And from phase one of the Hirsh process, which is strategize we know what our daily cost per lead and number of leads needs to be because we know that from day one. It doesn’t mean we hit it from day one. And so in those cases when you put something out there in your ads that is not working you have to take a step back, and you have to look at the following things, and this is the question that my team always asks themselves. One, is the ad getting clicks? If the cost per click is very high most likely you have a messaging problem. Your ad copy, your ad image, your headline, or even the actual opt in, or the webinar title that you’re sending people to has a disconnect in what people want. And really ask yourself that, and if you’re new use your existing audience or people you know in your circle and ask them what they would want to click on if you don’t have that data. So we do that analysis first. Is the cost per click really high? Yes? There’s a messaging problem either in the ad copy, image, headline, or the actual thing we’re sending people to. Two. Is the ad click low, but we’re not getting conversions. Are we getting dollar clicks and no conversions or very few conversions. Is there a landing page problem? And I’m going to say this because it probably sounds so obvious but I cannot tell you especially people who use click funnels, how many times there’s a tech problem. When my team comes to me on the huddle, and they say like, “Hey we’re getting dollar fifty clicks, and we’re not getting any conversions,” I’m like, usually I’m like, “It’s the funnel.” It’s got to be a tech piece because most of the time, and I’m not going to say every time, but most of the time in my experience, the ad does the convincing and the landing page just needs to be very basic and easy for somebody to opt in. The button needs to be up high, it needs to work, all those things. So a lot of times, if that’s the case, it’s the funnel or the pixel is not reporting correctly. So we, as a procedure in our team, opt in to every funnel as if we’re a lead before we turn the ads on. And two, check all those pixels. Because like, I get, 50% of the time if that’s what it’s saying, the landing page isn’t converting, it’s actually a tech or a pixel issue. So just keep that in mind because it sounds so obvious when I say it, but like especially with click funnels which has a lot of glitches, especially lately. Don’t rule that out. So when you start your ads that’s the first thing to look at. Then we can move to targeting. And from there, you know, in Facebook ads you can look at things like your relevancy score, are your ads getting engagement in comments, you know those type of things can tell us like is our audience on par? And you can do a lot of testing, and my best advice to you with audiences is use any data that you already have to make great audiences. So use look alike audiences of anything you possibly can. Like be creative with that pixel and also use that to find more interest audiences. And then you have to test them and you have to separate them out. Especially in the beginning. Don’t put 15 interest audiences inside of one ad set because you’ll never know what was and wasn’t working and especially when you’re new or you’re trying to figure out what target audiences work for you, you have to separate them out so that you can have data to compare. And so, if you do those things and you go into your ads with that type of a mentality. And the final thing I want to mention is let your ads run for … so you need to have a threshold, if you’re threshold, let’s say for example is I can pay five dollars for my webinar registrations and that’s my max cost per lead, let your ad set spend about seven dollars. Just over your threshold and if it gets zero leads, turn it off. People have like 24 hours, 48 hours, yes, it takes a good couple of days for an ad to optimize. But there are also some cases where it’s like well, this ad has spent seven dollars, it hasn’t been 48 hours. It’s gotten no clicks. It’s probably not going to convert. You can use some common sense with that. So there’s not like again a cookie cutter way of when to turn ad off and on again. The way we do it, is we have a threshold, here’s the max that we can pay, cost per lead and once it spends just over that max if it’s zero leads we turn it off. If it’s gotten one and it’s really close, it may optimize and get lower so you leave it on. So makes sure you let your ads run long enough to test them and especially if you also have a new ad account your pixel has not actually received enough data to know what is and isn’t going to work and what is responding versus not. Like who is responding versus not and as you continue to run ads Facebook is extremely powerful at honing in on who responds to your things. So I cannot emphasize enough to let that pixel seize in, let it capture data and then leverage the crap out of that data because it is more powerful than any unique interest based any crazy targeting you can come up with as a marketing. Facebook is always going to win. So if you look at things from that perspective and you let your ads run and you look at it from, okay, here’s all the pieces, what is or isn’t working, you’re marketing will work 100% of the time. Now you might have to change your webinar, or change your opt in that you’re offering and test something different or write 10 different versions of ad copy before you have a winning one, but it will work with that type of persistence and that’s the golden ticket is the people who don’t give up and they continue to look at their marketing and all those pieces and perfect it and hone it in and then eventually, they scale it. So don’t give up too soon. I just see that happen way, way too often and if you guys want access to the Hirsh marketing report which I put out every single month, which shares what is and isn’t working, on some Facebook changes, just basically the entire inside scoop of the last month, behind the scenes of our agency of our 60 plus clients, then you can go to hirshmarketingreport.com and sign up to receive it. We sent it out at the beginning of every month and that will help you get some tips and tricks that will maybe give you a shortcut if your running ads on what is and isn’t working. I show you the best converting ads. You could get ad copy ideas. I show you what audiences aren’t working. I also share anything like Facebook in general that is and isn’t working and strategies. It’s usually about 15+ page pdf. 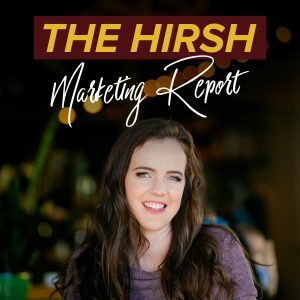 I put a lot of energy and effort into it every month and I’d love to share it with you so go to hirschmarketingreport.com and Hirsh is H-I-R-S-H, I’ll see you guys later.